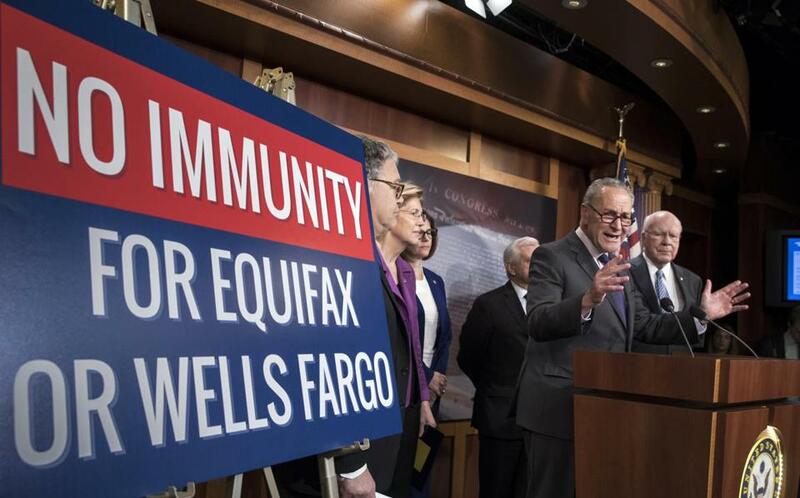 Senate Democrats discussed consumer protections in the wake of a massive data breach at Equifax and a scandal at Wells Fargo. The Equifax data breach and the Wells Fargo fake accounts scandal have given America a peek into business practices at some of America’s biggest financial institutions. In both companies, a related practice popped to the surface: forced arbitration clauses. These little clauses, often buried in a fog of fine print, are a way for the companies to slither out of accountability when they cheat their customers. And Senate Republicans are on the verge of ramming through a resolution that will allow companies like Equifax and Wells Fargo to continue using these tricks to get away with even more misconduct. Here’s how the trick works: Let’s say you discover an unexplained $20 fee on your credit card statement. You call, spend a long stretch on hold, get shuffled from person to person, and, finally, learn that your credit card company won’t remove the fee. What now? If your credit card company cheated you out of $20, there’s a good chance it cheated a lot of other customers out of $20. So you can join — or start —a class action, which gives you the chance to go to court and get your money back. It’s not a lot of money, but add up all the people in the class action, and the company feels some real heat if they cheat a lot of their customers. But if your credit card contract contains a forced arbitration clause, you can’t go to court. Instead, your only option is to pony up $200 to file an arbitration claim. No one is going to pay $200 to try to recover a $20 fee — and your credit card company knows it. That means it can get away with cheating you on small fees forever. And it can juice its profit by cheating millions of its other customers too. Forced arbitration is bad for consumers. That’s why the Consumer Financial Protection Bureau (CFPB) issued a new rule earlier this year that limits the use of forced arbitration clauses in financial contracts and lets consumers join class action lawsuits if they get cheated. Read: Equifax messed up. Now consumers have to pay? Bank lobbyists hate the CFPB’s new rule, and they’re pushing Congress hard to reverse it. So far, Republicans have been happy to oblige. While Democrats in the House of Representatives voted unanimously against a resolution to repeal the CFPB rule, House Republicans voted in lock step to pass it. If Senate Republicans follow suit, the rule — and protection for customers who get tricked — will disappear. The Senate vote on the resolution could happen this week. Equifax, Wells Fargo and other giant financial institutions use forced arbitration clauses. But the new CFPB rule would stop them in their tracks. Any senators who vote to reverse the CFPB rule are saying loud and clear that they side with those companies instead of with their constituents. A broad coalition of groups representing consumers is fighting hard to keep the new CFPB rule alive. The Military Coalition, which represents more than 5.5 million veterans and servicemembers, supports the rule because “our nation’s veterans should not be deprived of the Constitutional rights and freedoms that they put their lives on the line to protect, including the right to have their claims heard in a trial.” AARP, which represents nearly 38 million American seniors, says the rule “is a critical step in restoring consumers’ access to legal remedies that have been undermined by the widespread use of forced arbitration for many years.” And the Main Street Alliance, which represents thousands of small businesses, says the rule will help small businesses fight against big financial firms that try to drive up their fees. Despite overwhelming public support for the CFPB rule, financial industry lobbyists are prowling the halls of Congress, claiming that the rule is bad for consumers because consumers fare better in arbitration than in class actions. That claim is laughable. According to a CFPB study, consumers recovered an average of $540 million annually from class actions settlements, while receiving less than $1 million annually in the arbitration cases the agency reviewed. It’s not even close. And if consumers prefer arbitration, that’s their choice — the CFPB rule doesn’t prevent consumers from choosing arbitration. The rule simply says that consumers should also have the option to go to court if that’s what they want. Senate Republicans should listen to service members, veterans, seniors, and small businesses — not bank lobbyists. As we continue to find out how much damage Equifax and Wells Fargo have inflicted on American consumers, the last thing Congress should be doing is reducing customers’ rights to hold financial companies accountable. US Senator Elizabeth Warren of Massachusetts is a member of the Senate Committee on Banking, Housing, and Urban Affairs.